A perfect recipe for kids lunch box that gets ready in just 10 minutes. 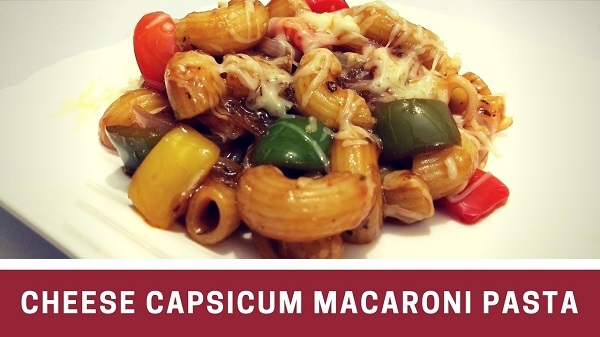 Learn how to make tasty and healthy Cheese Capsicum Macaroni Pasta at home. Cook Macaroni Pasta as per the instructions on the packet, once cooked drain the water and keep aside. Heat 1 tbsp. Oil in a non-stick pan over medium flame. Saute Garlic & Onion in oil for about 2 minutes. Add Capsicum and sauté for another 1 minute. Add boiled Macaroni pasta, mix well and cook for another 2 minutes. Switch off the gas, add grated cheese. 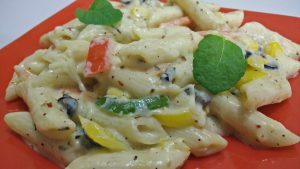 Serve hot Cheese Capsicum Macaroni pasta or let it cool down for 5 minutes and give in kids lunch box. Madam what is hot n sweet tomoto sauce?? It’s made from Chilli & Tomatoes. I have used “Maggi” brand Hot & Sweet Tomato Sauce in this recipe.